When will be Spectacular Spain with Alex Polizzi next episode air date? Is Spectacular Spain with Alex Polizzi renewed or cancelled? Where to countdown Spectacular Spain with Alex Polizzi air dates? Is Spectacular Spain with Alex Polizzi worth watching? Spain is a land rich in history, tradition, culture and natural beauty, with a wide-ranging cuisine based on fresh local produce. Join Hotel Inspector Alex Polizzi as she embarks on a personal tour, sharing her passion for the country, culture and people, and making some new discoveries along the way.Alex explores all it has to offer region by region, from its remote villages to its cosmopolitan cities, seeking out its best-kept secrets. Alex Polizzi arrives in the popular holiday region of Andalucia, visiting the scene of countless spaghetti westerns in the Tabernas desert, the spa town of Lanjaron in La Alpujarra in the foothills of the Sierra Nevada mountain range, and the ancient city of Granada with its splendid Alhambra palace. In Western Andalucia, Alex stays at the glamorous Beach Club at Marbella and meets the man who has played host to A-list jetsetters for decades. In Jerez, she learns about sherry and admires the local dancing horses. In ancient Cadiz, she takes a peek through the camera obscura in the Torre Tavira, before ending her journey with a bicycle tour of Seville and admires the creations of Spanish designer Victorio y Lucchino. Alex explores inland Spain, enjoying the history, art and culture of Madrid, visiting the picturesque town whose windmills inspired some of the anecdotes in Don Quixote, meeting a former monk who built a huge cathedral by himself, and ending up in the beautiful old university town of Salamanca, a Unesco World Heritage site. Spectacular Spain with Alex Polizzi next episode air date provides TVMaze for you. 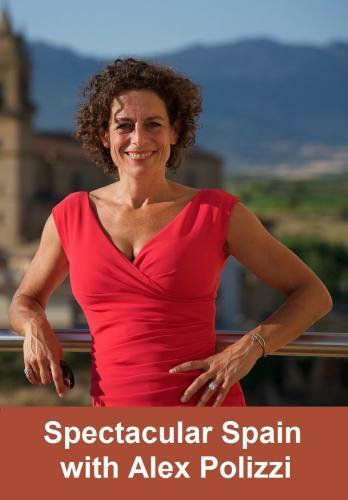 EpisoDate.com is your TV show guide to Countdown Spectacular Spain with Alex Polizzi Episode Air Dates and to stay in touch with Spectacular Spain with Alex Polizzi next episode Air Date and your others favorite TV Shows. Add the shows you like to a "Watchlist" and let the site take it from there.